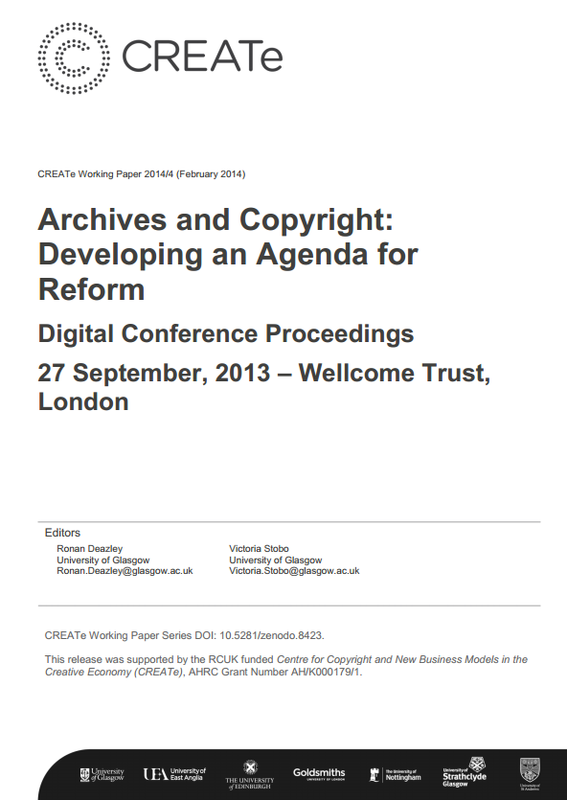 The Symposium “Archives and Copyright: Developing an Agenda for Reform” was held at the Wellcome Trust on 27 September 2013. It was organised by Ronan Deazley and Victoria Stobo in collaboration with the Wellcome Library, and represents the culmination of an RCUK-funded research project concerned with the manner in which the copyright regime both enables and inhibits the work of heritage institutions, and in particular archives. A web resource offers short videos of the presentations at the Symposium, full transcripts, an introductory essay and a bibliography, as well as other project-related outputs (available at: www.create.ac.uk/archivesandcopyright). This document is the authoritative, paginated and citable version of the Symposium proceedings (available for download at: https://www.create.ac.uk/publications/archives-and-copyright-developing-an-agenda-for-reform). The Symposium and the production of the web resource have been generously supported by the Wellcome Trust, the UK Archives and Records Association, the British and Irish Law Education and Technology Association (BILETA), and CREATe, the RCUK-funded Centre for Copyright and New Business Models in the Creative Economy. Download Archives and Copyright: Developing an Agenda for Reform.